A new edition of the critically acclaimed Pearls: Treasures from the Seas and the Rivers exhibition will open in Moscow on July 11th as part of the Qatar Russia 2018 Year of Culture. The exhibition was curated specifically for this year's Year of Culture programme and will display over 100 pieces of jewellery and other examples of pearl craftsmanship made from freshwater pearls born in Central Asia, 50 of which are new, never-before-shown artifacts. The Qatar Museums (QM) exhibition is hosted by the World Diamond Museum at the Exhibition Centre of the State Historical Museum in Moscow from 11 July 2018 to 1 October 2018. The exhibition, which is considered one of QM's flagship initiatives and is the first travelling exhibition organised by the institution, was designed to introduce audiences to the history and transformative impact that the pearl industry had on Qatar and the world. It chronicles pearl fishing in Qatar, providing an insight into the ancient methods and techniques used by pearl divers and an overview of the pearl trade in the Gulf. This is the sixth time that Pearls: Treasures from the Seas and the Rivers has travelled around the world, with the last show taking place in China as part of the Qatar China 2016 Year of Culture. Commenting on the exhibition, its curator Dr. Hubert Bari said: "Pearls have long inspired artists and painters with their quiet elegance and mystery. This diverse exhibition will answer many of the questions surrounding these natural wonders, while taking visitors on a fascinating journey through the history of pearl diving and trade in Qatar. The exhibition is a major highlight of the Qatar Russia 2018 Year of Culture, which will see two great cultures explore unexpected historical parallels through the use of pearls in traditional design and jewellery making. We hope that this is something that will help bring our people and countries ever closer together." A seven strings Gulf pearl necklace made in Qatar by the leader of pearls of the country: Husain ALFARDAN. The necklace is made with perfectly matching pearls. It takes years and thousands of pearls to succeed into such a creation. Private collection. Indian necklace made in Jaipur (north India) with pearls from the Gulf. 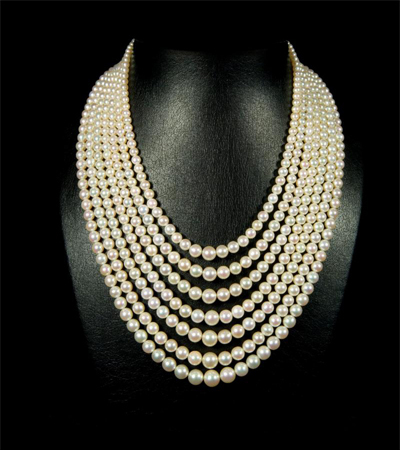 Most or the Gulf pearls were sold to Indian pearl dealers. From India, they were sold to the rest of the world. 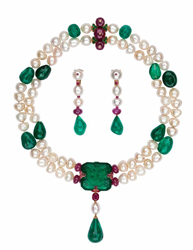 Cartier necklace made of pearls around and an extraordinary emerald stone. It was carved during the time of the Moghuls, in India (circa 17th century) This necklace has been made to commemorate the second Millennium, in the year 2000. Qatar Museum collections.